Bodacious Business Horoscopes: Lavish Leo! 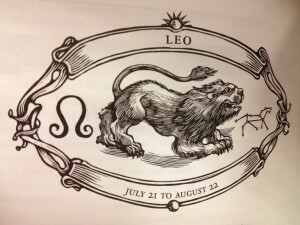 This month’s “Bodacious Business Horoscopes” entry highlights that regally royal member of the zodiac system, Leo the Lion. My good friend King (or Queen) Leo rules the astrological skies from July 21 or 22 to August 22, and greatly esteems both the limelight and applause. I’ll speculate that the high-performing sales or marketing professionals at your company are predominantly (astrological) Leos. Whether an attention-seeking Leo is loud and proud or quietly majestic, most astrologers believe a shy Lion/Lioness is a rare commodity. Leo is a Fixed Fire Sign–Here’s What It Means for Your Business: As the fixed fire sign of the zodiac, Leos are natural leaders, though quite opinionated and “settled” regarding how they operate. Don’t be surprised when the fearless folks at your company willing to face an angry client or pinch-hit during an important presentation turn out to be Leos. Independent Leos Appreciate an Audience (and Plenty of Control, and a Luxurious Office): To be blunt, your Leonine employees are take-charge gals and guys. Rather than making them feel inferior or subordinate to you, it’s better to let them rule a small kingdom of their own. Although the Lions in your office are relentless when pursuing a new client, account or project, their self-regard requires that you offer steady praise and admiration for their ambitious abilities. On the flip side, a Leo CEO or business owner can be an overzealous charmer who (sometimes) takes credit for a subordinate’s hard work. Fortunately, Mr. or Ms. Leo generously bestows praise and compliments upon devoted employees. Yes, Leo is the zodiac equivalent of the Pied Piper! Oh, one last thing: Leos love dwelling in luxurious surroundings, and the work environment is no exception. Keep this in mind when a Leonine new hire queries you about his or her assigned office/cubicle, the furniture it holds, access to direct sunlight, and proposed wall furnishings. The Leo in Your Professional Den Is an Outgoing and Accepting “Big Cat”: In general, employees and leaders whose sun sign falls into Leo’s house are the founding members of any company’s “welcome wagon.” Additionally, these majestic cats do not tolerate failure at work! Your Lions’ most positive traits: honest and loyal, a happy disposition, dignified, generous and hospitable (but can edge into spendthrift ways), friendly, and courageous (bordering on self-sacrifice). Per The Zodiac Little Giant Encyclopedia, “Leo often shows his or her inner strengths when under great pressure or when a crisis occurs.” When your business encounters a precarious situation, rely on a Leo to handle it à la Harvey Keitel’s debonair portrayal of Winston Wolfe in Pulp Fiction. Whether related to you by blood or nondisclosure agreement, self-assured Leo will extinguish business fires with a powerful “roar” (and never apologize for how s/he makes it happen). Leo Employees and Executives Can Be Immune to Others’ Suggestions: All zodiac signs have their negative traits, and Leo is no exception. Sure, these intrepid peeps are the ones most likely to take a professional bullet for you. But they also keep a few imperfections under wraps. Your Lion/Lioness can be: stubborn and willful, arrogant, boastful, indifferent, and, as previously mentioned, has a tendency to take credit for other people’s work. Be advised that the Leos in your office enjoy being part of a team. But without a sense of recognition as a leader, they might lose confidence and not deliver their personal best. No matter the level or title, a Leo with a tangible “empire” will motivate the troops to trudge up the slope of the steepest project, presentation, or problem. Leos Will Sell Just About Anything (and Do So with Assertive Flair): Never go in against a Leo when a huge business transaction or new account or new product is on the line (not so inconceivable, I think). The Leonine professionals you employ are born salespeople who excel at showmanship. Henry Ford, a pricing genius of the automotive industry who initially viewed the world in black and … black. A Completely Speculative Business Interpretation of Leo’s Astral Assets: Here’s something you don’t see every day–a business interpretation of a zodiac sign’s ruling planet, lucky day, lucky numbers, and primary colors. Final Snide Commentary on Leo the Lion by the Author of Born on a Rotten Day: Per astrologer Hazel Dixon-Cooper (and her outrageous sense of humor), Leo is “the most dominant, arrogant, and self-centered” creature prowling your hallways. Does Leo the Lion rule your birth date? If so, did this profile trigger any head-shakes for you regarding accuracy? What other interpretive traits would you add to this zodiac sign from a business perspective? For those of you with a birthday dwelling in another house, your blog post will come, I promise. Next up, toward the end of August, will be Virgo the Virgin (hold your own snide commentary until then).